Sunday, October 14 from 12 - 5 p.m.
Amidst the tree-lined lanes and colorful foliage at Lost Creek Reserve, we will host our biggest event of the year, Fall Farm Fest. On October 13th and 14th the historic Knoop homestead at the Reserve will be transformed into a hub of activity. Over the two-day festival, thousands of people will join in on the fun to celebrate Miami County’s agricultural heritage. General admission is free but there are charges for pumpkins, pony rides and corn maze/shooter. Click on the tabs to get an idea of what will be happening in 2018! More info to come this week. 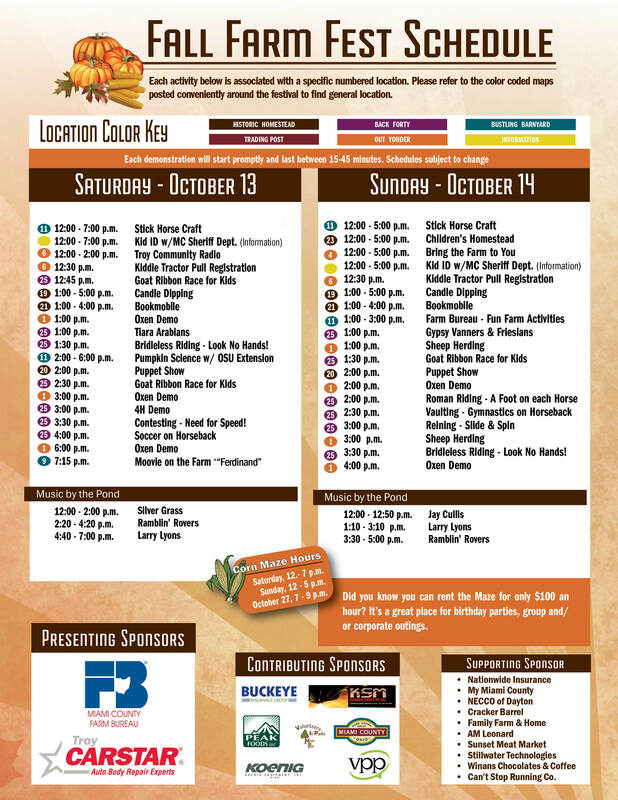 We hope to see you at Lost Creek Reserve on October 13th and 14th, you won't want to miss this event! Are you ready to have some Home. Grown. Fun? A weekend spent at the Fall Farm Fest is always filled with activities for all ages. Various farm demonstrations will be happening all weekend long! Find your way out of the six acre corn maze. After you have conquered the maze, stop by to try your hand at shooting corn from the corn cannon. Ready, aim, fire - at a couple different targets. Every year, our Scarecrow Lane is a highlight of the Fest. Take a wagon ride or walk down the charming farm lane line with scarecrows created by local business, organizations and families. The eve of creativity shown is amazing. Some are elaborate and some are simple but all are a must see. Don't forget to stop by the Information Booth to vote on your favorite! Enter the Scarecrow Contest TODAY...it's FREE! Limited spots available. Registration for entering ends October 10th. Check out this flyer for more information. 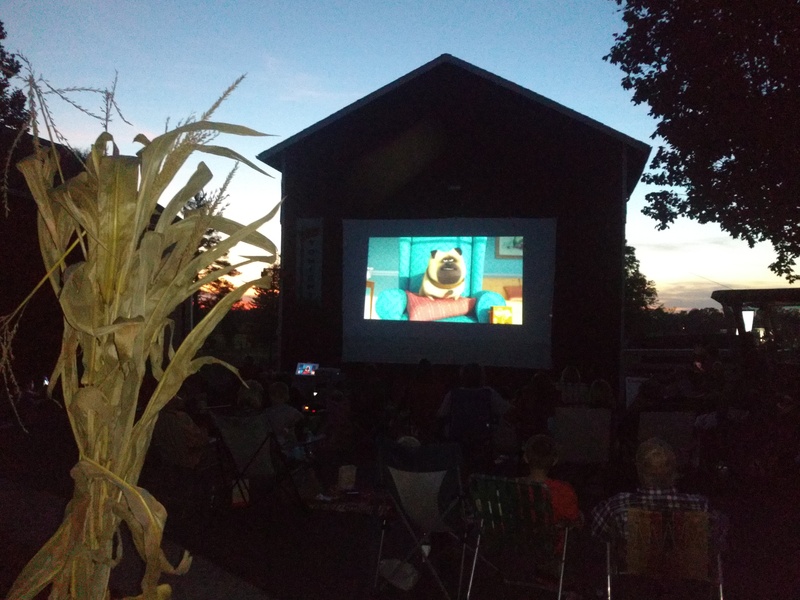 The Miami County Farm Bureau, will be hosting "MOOvie on the Farm" on Saturday, October 13th directly following the festival fun starting around 7 p.m. Unwind with your family after a busy day by enjoying the movie Ferdinand under the stars. Don't forget to pack a blanket or chairs. Don't miss out on the delicious food and unique items for sale during the Fest. Be sure to bring an empty stomach, empty trunk and a full wallet (there is no ATM on site). We will have plenty of fresh, delicious food on site at the festival. Please support our local businesses and organizations by stopping by to enjoy lunch, dinner, desserts and snacks! We will once again have some amazing, local vendors out at the Fall Farm Fest. Stop by their booth for info and hands-on demos. Check festival schedule for dates and times. Kid IDs done near information booth. Learn more about gardening and about the OSU Extension Master Gardeners. Stop by their fun booth to guess the pumpkin weight and be entered to win an awesome prize! Huge supporter and partner from the beginning, located in the Back Forty, various horse demos (Roman Riding, Goat Races). Stick Horse craft in the bank barn. If interested in being a vendor or exhibitor at the 2019 Fall Farm Fest, please fill out the Food Vendor application or the Exhibitor Application. You may also call the office at 937.335.6273 and ask for Mindy. Take a break from all the festival activities and sit amidst the 100 year old trees to listen to local artists. Musicians will perform at the natural amphitheater in front of the house/barns. This event would not be possible without the support from our many sponsors. Thank you 2018 sponsors! VPP Industries - More than ink and paper.